Twitter introduced autoplay video feature for his user, which is enabled by default. But this feature increased the data consumption, due to that few person don’t like it. 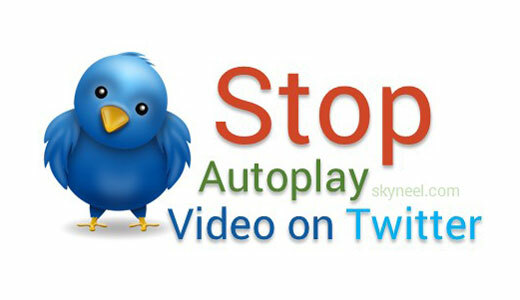 In this guide we have to discuss how to turnoff or stop autoplaying video feature in Twitter on Android Phone. During working on social networking websites there are several reasons that’s why you need to disable autoplay video feature in Twitter on Android phone. There are most popular networking websites are constantly improving and provide latest features for his users. During surfing on social networking website these GIF or videos, will start to play automatically. It’s very cool feature for all those users who are too much crazy about watching the videos. It is a good feature for those who have fast speed internet connection. But this feature increased data consumption, so many people don’t like it. But by changing few simple settings in your Twitter account, you can easily turn off Auto playing feature. Step 1: You have to open your registered Twitter account. Tap on the cog icon which is located at top corner of your phone screen. Step 2: Tap on the Settings & Privacy then Choose Data Usages option. In Data usages window tap on the “Video autoplay” option. You have to choose “Never” option to turnoff or stop autoplaying video feature in Twitter on Android Phone. You have saw the Autoplaying features started by Facebook recently. In which any video which is shared on Facebook, automatically play when you reach on that area of Facebook page. Although it is a good feature for those who have fast speed internet connection. This feature increased data consumption, so many people are not liking it. But by changing some settings you can turn off this Auto playing feature. To view detailed information click on the how to turn off or stop autoplay video feature in Facebook. Do you know about YouTube Autoplay Video feature? If YouTube Autoplay Video feature is turn on then next video autoplay run at your screen. Lot of YouTube user’s want to know how could turnoff YouTube autoplay feature from his Android or Smartphone. YouTube recently launch a test this feature at YouTube home page. Given feature is available for Android, iOS devices along with Web version. If you have old version of YouTube and want to use Turnoff YouTube autoplay feature from your smartphone then first you have to update your app. You can also check your YouTube app is updated or not from Google Play Store. You also allows you to change the speed of any video. If you want to know more, then read this article how to watch YouTube videos in fast or slow motion.